Stomatal opening is sensitive to the evaporative demand (vapour pressure deficit; VPD) and a high VPD reduces stomatal aperture to restrict water losses in certain genotypes of many species (Turner et al., 1984; Vadez et al., 2013). Crop simulation analysis has shown that this restricted transpiration (also called maximum/limited transpiration rate) would have beneficial effect on yield and also that it would lead to water saving and higher transpiration efficiency (Sinclair et al., 2005). Transpiration response to VPD is usually measured at vegetative stage (30-40 DAS; V5-V7 stage in cereals). Plants can be grown and measured in growth chamber (Choudhary et al.,2013) or grown in glasshouse and measured in growth chamber after one day acclimation prior to VPD response measurement (Kholova et al., 2010; Ghoolipoor et al., 2010). The VPD response measurement can also be done outdoors, under weather conditions where VPD would reach a value of at least 3 kPa in the middle part of the day (Zaman-Allah et al., 2011; Belko et al., 2012). Plants are grown in plastic pots (diameter 22 cm and height 20 cm) filled with 5 kg of soil (composition 3 Alfisol: 1 Sand). Fertilize the soil with di-ammonium phosphate at the rate of 0.3g kg-1soils. Three seeds are sown in each pot at three hill close to center of pots and thinned to two seedlings a week after sowing, for a final plant number per pot of 1-2, depending on species. Thermo-hygrograph sensor (Tinytag Ultra 2 TGU-4500 Gemini Datalogger Ltd, Chichester, UK) is positioned within the plants at canopy height in glasshouse, which records data on temperature and relative humidity (RH) % on an hourly basis. For each experiment 7-8 plants are grown for each genotype under well-water condition till 30 days after sowing (DAS), out of which only the five most uniform plants (reps) are selected for transpiration measurement. Once plants reach the stage to test (5-6 fully expanded leaves) soil evaporation is kept to minimum by adding a plastic sheet and a layer of plastic beads on top of the sheet. Pot are then watered to reach field capacity and then shifted to growth chamber for 1-2 days acclimatization with day/night temp and RH% of 32/26°C and 60/80% respectively (can be changed based on requirement). The photosynthetic photon flux density in the growth chamber is between 500-700μmol m-2 s-1 at canopy height and 13 hours of light. Growth chambers do record temperature and relative humidity, however we usually hang an additional temperature and humidity sensor (USB data loggers, Lascar Electronics) mounted at canopy height inside a punched thermocol box of each chamber to measure the air temperature and humidity in the chamber at every 5-min interval. 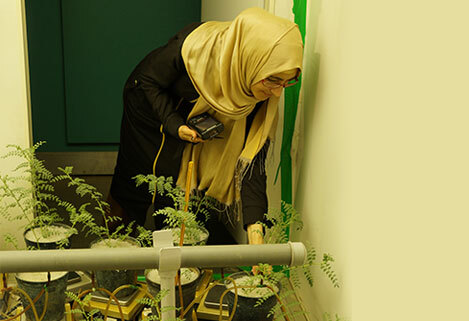 Water the plants in sufficient amount in the afternoon before transpiration assessment day and allowed to drain extra water 2-3 h. This can be done after the watering, the day before the experiment. After acclimatization, plants are exposed to an increasing ladder of VPD from 0.9 to 4.1 kPa by increasing temperature and decreasing RH% (80-30%) at every 60-90 min interval, usually from 0700 to 1600 hours (India Standard Time). Examples of VPD ladder at 60 and 90 min interval are attached. Sometimes it is difficult to maintain lower humidity (RH% 30-40) in growth chambers in that case a dehumidifiers (Daikin) is used. Similarly, in case maintenance of high humidity (70-80%) is difficult, growth chamber humidifier can also be used. 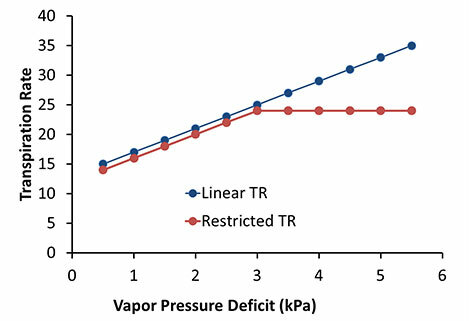 VPD is confounding function of air temperature and relative humidity of atmosphere (Eq 1; Monteith and Unsworth 1990) and change in temperature could markedly alter the plant response to VPD as saturated vapor pressure (SVP) increases exponentially with increase in temperature (Eq. 2; Murray 1967). Therefore, ideally a VPD ladder setup should not have much variation in temperature ( 1.5oC), and therefore the use of de-humidifiers is preferred. That said, many VPD response experiments still do use relatively large temperature increases (8-10 degrees) and do in fact coincide closely with natural conditions outdoors. Plant transpiration is measured gravimetrically from the changes in pot weight between consecutive weighing. Pots are weighed on a 0.01 g precision scale (Kern Balances) at every 60 or 90 min interval of increasing VPD. In the growth chambers, the time used to weigh the pots is used to alter the VPD regime. At the end of day plants are harvested and the leaf area (LA) measured (LI-3100, Li-Cor, Lincoln, Nebraska, USA). Transpiration Rate (TR) is calculated as transpiration (mg) per unit of leaf area (m2) and per unit of time (s) (VPD workbook attached). Download the temperature and RH% data from the data logger. Take the average of temp and RH% recorded at 5 min interval for each 60 or 90 min VPD intervals. Calculate VPD as per Eq . SVP values at particular temperature and calculated VPD excel sheet is attached. All data of TR at corresponding VPD are combined for a two-segment linear regression analysis (Prism 5.01, GraphPad, Software Inc.). If a difference in slope (p < 0.05) is not obtained in the regression, then all the data for that genotype are represented by a single linear regression. For those genotypes found to be represented best by the two segments, the regression analysis generates two slope values and a VPD breakpoint between the two linear segments (Figure 1).